As you may have heard, the 2010 football season marked the end of an era in college football. Beginning with the 2011 season, the Big 12 will have two fewer members, as original Big 8 member Nebraska, and longtime conference rival Colorado move on to the Big 10 and Pac-10 respectively. The Big 12 will continue to exist, at least for a time, as a smaller 10-team conference sans divisions. 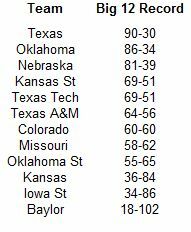 With that being the case, i thought it would be interesting to look back on the Big 12 as it existed for a decade and a half and provide you with some interesting statistical tidbits and minutiae. Enjoy. Well, its debatable. Oklahoma has the most Big 12 Championships with 7. The other 12 teams in the conference only have 8 combined titles, with Texas and Nebraska being the only other teams with multiple titles (3 and 2 respectively). Oklahoma also has the most division titles with 8. Again Nebraska and Texas are second and third in this respective category with their roles reversed. Nebraska has 6 division titles and Texas has 5. However, despite their dominance, particularly since Bob Stoops arrived in Norman before the 1999 season, the Sooners do not own the league's best conference record. That distinction belongs to Texas. Oklahoma does own the best record in the conference since 1999, edging out Texas 78-18 to 76-20. The best team to never appear in the Big 12 Championship game is obviously Texas Tech. The Red Raiders are tied with Kansas State for the 4th best record since the inception of the conference, but thanks to their placement in the South division with Texas and Oklahoma, they were never able to win the division (though they did tie for the crown in 2008). The Red Raiders are also tied with Texas for the fewest losing seasons in conference play with 2, and they are also the only Big 12 team to be bowl eligible in each season of the Big 12's existence. 11 of the league's 12 teams have at least tied for their respective division crowns, with the lone exception of course, being Baylor. In fact this past season, the Bears posted their first-ever non-losing season in Big 12 play when they went 4-4. However, before we start dumping on the Bears and their lack of success, it also bears (nice eh?) mentioning that Kansas and Iowa State have had only one winning season in conference play apiece. Kansas, as you may recall, went 7-1 in 2007 on their way to the Orange Bowl, while Iowa State managed a 5-3 mark back in the year 2000. Which Big 12 team has been the best at defending its home turf? The answer, will not shock you. Oklahoma narrowly edges Texas as the best home team in the Big 12's existence. Oklahoma moved into the top spot after the Longhorns went winless at home in the Big 12 in 2010. After losing in Austin just 3 times during Mack Brown's first 12 years in the lone star state, the Longhorns amazingly lost all 4 of their Big 12 home games this past season. Meanwhile, Oklahoma has lost just once in Norman to a Big 12 foe under Bob Stoops (it came in 2001 to Bedlam rival Oklahoma State). 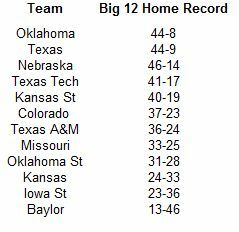 You'll notice Oklahoma and Texas have significantly fewer home games than the other 10 Big 12 teams. This is because they each forfeit a home game every other year in order to play each other at the state fair in Dallas. And who has performed the best in the road? Again, the answer is not likely to surprise you. Texas and Oklahoma are once again tops in the conference, this time in true road record. These games comprise only 'true' road games, so any neutral site game (including every Oklahoma/Texas Red River battle) is not considered. 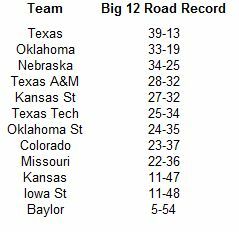 Nebraska joins the Longhorns and Sooners as the only other Big 12 team with a winning record in road games. Baylor has been by far the worst road team in Big 12 play. In fact, they did not win their first Big 12 road game until 2005, the 10th year of the league's existence. 2010, as mentioned earlier, not only marked Baylor's first .500 or better season in the Big 12, but it also marked the first time they managed more than a single road win. The Bears defeated both Colorado and Texas on the road in 2010. The victory over Colorado means the Buffs are currently the only team to ever lose multiple times to Baylor at home in Big 12 play (Baylor also beat them in 2006). The Biggest Homefield Advantage Is In...Lubbock?! That's right. 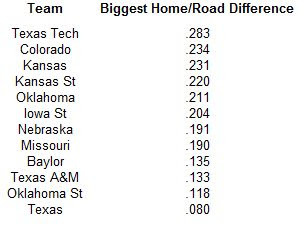 Texas Tech has the largest discrepancy between their record at home and their record in 'true' road games. The Red Raiders win over 70% of the time in Lubbock, but see their winning percentage drop to just over 42% on the road. Colorado also enjoys a significant homefield advantage (compared to their road performance) playing in Boulder. Texas has shown the smallest difference between their home and road record, meaning they are just as tough to beat on the road as they are in Austin (usually). If you spent any time this bowl season watching ESPN after New Year's Day, you no doubt heard the talking heads going on and on about how 'awful' the Big 10 was. They loved to site and ridicule in particular the league's 0-5 mark on January 1st. However, what they failed to mention was that all 5 Big 10 teams were underdogs in those games, with Northwestern (9 and a half point dogs to Texas Tech) and Michigan State (10 point dogs to Alabama) coming in as prohibitive underdogs. In order to come up with a more sophisticated way to look at how a conference (or team) performs in the bowl season, it would help to know the probability they had of winning their bowl game. One way to estimate win probability is to use the point spread or Vegas line. While the point spread is to some degree influenced by public opinion (in the form of line shifts), it is for the most part an unbiased rating system. In order to determine how likely a team with a given point spread was to win a particular game, I looked at all games played between IA teams from 2005-2009 where there was a point spread of at least one point (i.e. the game was not a pick em' or had a half point favorite) and determined who won the actual game (covering the spread was not important in this exercise). I then (somewhat) arbitrarily divided the results into difference ranges. They are listed in the table below. For the most part, the numbers are pretty intuitive. When a team is favored by less than a field goal, the game result is usually a coin flip, with the favorite prevailing just over 50% of the time. When the margin increases to at least a field goal, but less than a touchdown, the favorite wins nearly 60% of the time. 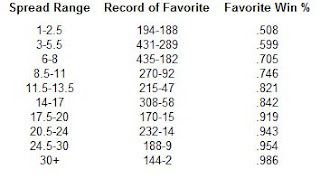 You can peruse the rest of the table for yourself, and see if you can guess the 2 teams that lost as favorites of 30 points or more (the answer is at the bottom of this post). I'll give you a hint, they both happened in 2007 and occurred within 2 weeks of each other. It is pretty simple to use these probabilities to estimate how many games a conference 'should have' won in the 2010 bowl season. 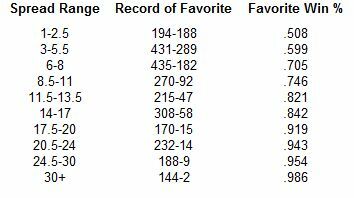 I'll go through the numbers for the Big 10 and then show you how each conference performed. The Big 10 had 8 teams participating in the 2010 bowl season. Ohio State was a 3.5 point favorite over Arkansas, meaning they had roughly a .599 chance of winning the game based on similar point spreads over the last 5 years. Northwestern was 9.5 point dog to Texas Tech meaning they had about a .254 chance of winning (that is 1 minus the chance of a 9.5 point favorite winning or 1-.746). Michigan State was a 10 point dog to Alabama, giving them a .254 chance of winning. Penn State was a 7 point dog to Florida, giving them a .295 chance of winning. Michigan was a 5 point dog to Mississippi State, giving them a .401 chance of winning. Wisconsin was a 3 point dog to TCU, giving them a .401 chance of winning. Iowa was a 3 point dog to Missouri, giving them a .401 chance of winning. And finally, Illinois was a 1.5 dog to Baylor, giving them a .492 chance of winning. 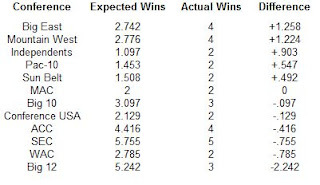 Add all those win probabilities up and we come up with 3.097 expected wins for the Big 10 based on the point spread. 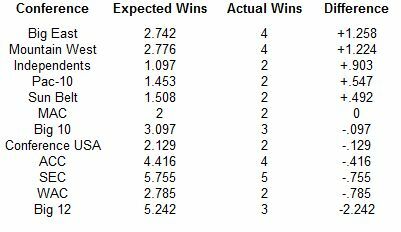 The Big 10 actually won 3 bowl games (Ohio State, Iowa, and Illinois), meaning they underperformed their expected win total slightly. Here is how every conference performed in the 2010 bowl season. The Big 10 was a respectable 7th among all 12 conferences. They were 6th of 11 if we remove the independents which is not really a conference and only includes 3 teams (Army, Navy, Notre Dame). The conference that performed the worst by far was the Big 12, and yet there was hardly a whimper of their poor performance on ESPN. The main culprit for the Big 12's bowl woes was Nebraska. The Cornhuskers entered the bowl season as the 3rd largest favorite (after Oklahoma and Boise), but were upset by the 14 point dog Washington Huskies. In a nice twist of fate, the Huskers are leaving the conference that performed the worst in the 2010 bowl season and joining the conference that was perceived to have performed the worst. Southern Cal to Stanford (as 41 point favorites) and Louisville to Syracuse (as 37 point favorites) are the 2 teams to lose as 30+ point favorites. 29 bowl games down, just 6 to go. With the interesting way the bowl season is set up this year, the final week features teams of varying degrees of competency. There is of course, the national title game next Monday. However, in between we have games involving the MAC champion (Miami of Ohio), a 6-6 also ran from the Sun Belt (Middle Tennessee), a co-Big East champ (Pitt), and a co-WAC champ (Nevada) just to name a few. In all, these final 6 bowl games include teams from 9 of the 11 IA conferences (only Conference USA and the Mountain West are absent). And just in case you were wondering, the bowl locks went 3-2 this postseason (narrowly missing a 4-1 effort thanks to Wisconsin's late score against TCU). As consistent as a New Year's hangover, every January the Buckeyes are playing in a BCS bowl game. Since Jim Tressel arrived in Columbus in 2001, the Buckeyes this Sugar Bowl marks the 8th BCS bowl game he has led the Buckeyes to (and 6th consecutive). Last season, the Buckeyes exorcised some BCS demons by upsetting Oregon in the Rose Bowl, breaking a 3-game BCS bowl losing streak. Now the Buckeyes look to exorcise an even bigger demon, winning a game against the SEC. In their most recent high-profile clashes with the SEC, the Buckeyes were embarrassed by Florida in 2006 and then by LSU in 2007. Can they salvage a modicum of national respect against Arkansas? The Buckeyes once again boasted the best defense in the Big 10 (the 5th time in the 6 years I have been calculating SDPI data that they have accomplished this feat). The offense was also quite proficient, ranking 3rd in the conference. Their defense will be challenged by an Arkansas offense that was tops in the SEC (thanks to their late-season run, they passed eclipsed Auburn as the best in the conference). However, while the defense was improved over their last place finish in 2009, they were still a below average 8th in the SEC. I think Ohio State will finally get a win over the SEC in this game, but I wouldn't trust them laying 3 and a half points. Somehow Middle Tennessee State made it to a bowl game and is actually favored. I don't say this to knock the Blue Raiders, I just find it hard to believe that Vegas, and the betting public view them as superior to the MAC champions. Middle Tennessee became the first Sun Belt team to win 10 games last season, and looked poised to challenge Troy for the Sun Belt title. However, the offense sputtered, and the defense declined as well. Middle Tennessee opened the year with a 3-6 mark, with the only respectable losses coming to Troy and Georgia Tech (the Blue Raides gave Memphis their only win in a 1-11 debacle). They managed to win their final 3 games, with two coming by a single point. To be fair, one did come against league champion Florida International. They enter the Go Daddy Bowl looking for their second ever bowl win and will face a team making its first postseason appearance since 2004. The Redhawks went from worst to first in 2010. They finished dead last in the MAC East in 2009 with a 1-7 mark (1-11 overall), but rebounded to go 7-1 in the conference in 2010 and upset Northern Illinois in the MAC Championship game. Their head coach, Mike Haywood, bolted for the greener pastures of Pitt after their stunning MAC title, but as you may have heard, will never coach a game there. Interim coach Lance Guidry will coach the team in the bowl before Don Treadwell takes over. The Redhawks were very balanced in the MAC, finishing 4th on offense and 3rd on defense. They appear to be the stronger team here, and taking them on the moneyline should be a smart move. I think most, if not all, Texas A&M fans would have been ecstatic if you had told them at the beginning of the season that their final destination for the 2010 campaign would be the Cotton Bowl. The Aggies had their best season in a decade and actually won a share of the Big 12 South for the first time since 1998. The Aggies looked to be in for another mediocre season after a 3-game losing streak left them at 3-3 halfway through the season. In hindsight, all the losses were respectable, with each coming to teams that managed to win at least 10 games (Oklahoma State, Arkansas, and Missouri), and two coming by seven points or fewer. After the final loss at home to Missouri, the Aggies won 6 straight, including victories over Big 12 Championship Game participants Oklahoma and Nebraska, and a win over arch-rival Texas that kept the 'Horns out of the bowl picture. The Aggies were very balances this season, ranking 4th in the Big 12 on offense and 5th on defense. The LSU Tigers were their usual down-to-the-wire selves, winning 6 games by a touchdown or less (often as heavy favorites). To be fair, both their defeats were also close, and both came on the road to BCS bowl participants (Auburn and Arkansas). LSU won games with a fantastic defense (2nd best in the SEC). Unfortunately, their offense was inconsistent and below average, ranking only 7th in the SEC. As the spread suggests, this game appears to be a toss-up, but it may be a good idea to take LSU. The Tigers are 4-1 in bowl games under Les Miles, with their 4 wins all coming by at least 14 points. Their lone lass came last season to Penn State by just two points. For Texas A&M, they have gone nearly a decade since tasting postseason victory. Since winning the 2001 Gallery Furniture Bowl over TCU, the Aggies have lost 4 straight bowl games, with 3 of the defeats coming by at least 24 points. The Pitt Panthers look to become the first of the Big East's 3 co-champions to win a bowl this postseason. West Virginia was upset by NC State and Connecticut was blown out by Oklahoma in the Fiesta Bowl. Pitt once again began the year with visions of a BCS bowl appearance, but were unable to follow through. Though they shared the league title, the lack of a breakthrough season cost Dave Wannstedt his job. Unfortunately for the school, their pick to replace Wannstedt, Mike Haywood, was also let go thanks to a domestic violence charge. Defensive coordinator Phi Bennett will coach the Panthers in the bowl. The Panthers were a solid number two in the Big East this season, ranking second on both offense (behind Cincinnati) and defense (behind West Virginia) in the conference. The Panthers did not distinguish themselves outside the conference, losing close games to Utah and Notre Dame, and getting waxed by Miami. For Pitt to get to 8 wins for the third straight season, they must beat a Kentucky team playing in its 5th straight bowl game. I know the bowl season has become a watered down display of mediocrity, but Kentucky still deserves props, as from 1977 to 2005, they played in just 5 bowl games. Kentucky featured their best offense (3rd in the SEC) since Andre Woodson departed, but alas, their defense was once again deplorable, ranking just 10th in the SEC. Pitt should probably win this game, but with the turmoil surrounding the program, I would stay away from this one. After the NFL playoffs have concluded on Sunday evening, tune in here to see one of the best dual-threat college quarterbacks ever. Quarterback Colin Kaepernick has rushed for 1000 yards each of the past 3 seasons. In addition, he has also passed for at least 2000 yards for 4 straight seasons. Kaepernick is the perfect player to run head coach Chris Ault's pistol offense, and with the Wolfpack's upset of Boise, Kaepernick and company finally earned a share of the elusive WAC championship. To the surprise of no one, Nevada boasted the best offense in the WAC. While their defense was not great by any means, they did manage a decent 4th place showing in the conference. The marks Nevada's 6th straight bowl game under Chris Ault, but they have lost 4 straight since winning the Hawaii Bowl in 2005. To break their bowl losing streak and potentially become one of two WAC teams to finish in the top 10 (its a long shot as they are currently ranked 13th), the Wolfpack must beat a Boston College team with a fantastic defense, but a terrible offense. Boston College closed the year on a 5-game winning streak after a 2-5 start. However, in those 5 wins, the Eagles still only managed to average 18.6 points per game. None of the 3 players the Eagles tried at quarterback were able to throw more touchdowns than interceptions. Seemingly, their only offensive threat is running back Montel Harris who rushed for over 1200 yards this season. Can the fine Boston College defense hold down the Wolfpack ground game enough for them to fly away with the upset? This seems to be a game that Boston College will keep close and that will subsequently be decided in the final moments, or one where a key turnover here or there by the Eagles will lead to an avalanche of Nevada points. Don't make a play here, but stay up to watch Mr. Kaepernick in his final college game. The BCS National Championship Game seems likely to be a high-scoring affair. I think it will be pretty high-scoring, but with the amount of time off since these teams last played (37 days between games for both teams), I think we could be in for a slow start with a lot of offensive misfires. Once the games gets settled though, we should be in for a treat. Oregon boasted the top-ranked offense in the Pac-10, and also featured a solid defense (3rd in the conference). The Ducks only played in one game decided by a single score, their skin of the teeth 15-13 win over Cal. Their other 11 wins all came by at least 11 points. On the other sideline, the Tigers from Auburn finished second in the SEC on offense (behind Arkansas) and a disappointing 7th on defense. Unlike Oregon, seemingly every game, particularly early was an adventure for Auburn. 5 of their first 8 wins (and 5 of their first 6 against BCS conference teams) came by 8 points ore fewer, with 3 decided by a field goal. The Tigers appeared to get things rolling down the stretch, as their only close win in their final 5 games was the great comeback over Alabama (won by a single point). Can Oregon stop the SEC's run of 4 straight BCS championships? They certainly have a good a chance as anyone, but if you forced me to make a pick here, it would probably be Auburn.